Recently, my family celebrated a special occasion at a dinner party so I decided to try my hand at a tiered cake and make it extraordinary by using fresh roses as the focal point. There are so many decisions when it comes to baking a cake for an event. First what flavor will it be and what type of frosting will complement that choice? The most important part of choosing the right cake is what will the finished product look like? 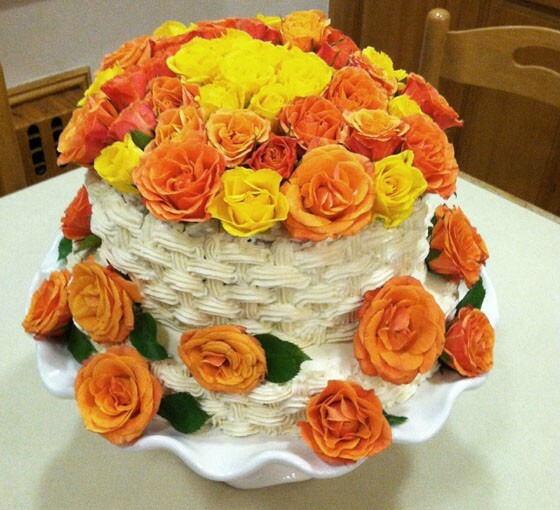 Since our celebration was taking place in November I settled on a light lemon cake filled with lemon curd and butter cream and decorated with butter cream in a basket weave design with gorgeous fresh roses in oranges and yellows. I used my 6 inch, 8 inch, and 10 inch baking pans each with 3 inch sides to bake two layers of each size for this cake. Step 1: Cut and rinse the roses as well as some leaves and let them strain. I left about 1 inch of the stem so that the roses could be poked securely into the frosting. Step 2: Assemble the layers for the tiers. The first to be frosted were the two, 10 inch layers which required a bit of leveling before frosting because the tops were uneven. Then each layer was split in the middle with a serrated knife. I placed one layer of the cake on a cardboard round that was cut just a little bit smaller than that layer. Next I applied a thin layer of the butter cream frosting to the top of the layer and then spread several tablespoons of lemon curd on top of the butter cream. Then I repeated the process for two more layers. The fourth layer was placed on top and covered with a thin layer of butter cream just as the other layers but no lemon curd was added. Finally, I spread a thin layer of butter cream on the side of the finished layers in order to prevent any crumbs from clinging to the finished cake. Step 3: Repeat step 2 with the 8 inch by 3 inch layers of lemon cake. Step 4: Repeat step 2 with the 6 inch by 3 inch layers of lemon cake. Step 5: Stack the layers. I put the 8 inch layers on the 10 inch layers then topped with the 6 inch layers onto a ruffled edged white pedestal cake plate. Naturally, as all bakers know, tiered cakes need support at the bottom or they tend to fall. I was in quite a rush and thought that the layers were light enough that adding the supports could be skipped. Well, I was proven wrong just as I placed the top layer onto the cake because suddenly the cake began to implode. Immediately, I took the top layer off and put it aside for another use. Whew! The two layers that remained were secure and not falling nor leaning. I was certain that they would hold up perfectly without the added supports before I began the decoration process. Step 6: The decorating. I decided on a basic basket weave design. I worked from the bottom tier up. I began piping the basket weave over the skim coat of frosting on the side of the cake because if any gaps were visible it would give the basket a look of authenticity. Step 7: Add the roses by wrapping the cut edge in a small piece of silver foil and pressing them into the cake. A few of the rose leaves were added to break up the bright hues of the orange and yellow roses. Step 8: Wrap the cake in plastic wrap to safely make the journey to the celebration. Step 9: Eat the cake but not the roses! Mine was used as a centerpiece before being enjoyed by everyone.